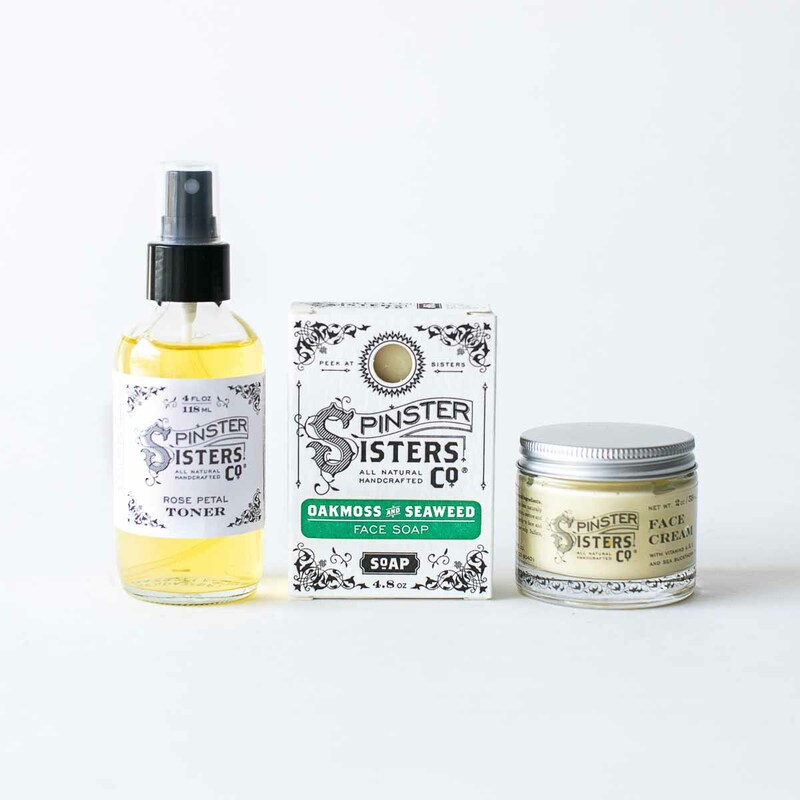 Face Aficionado | Samplers and Gifts | Spinster Sisters Co.
Our Face Care's simple, natural ingredients list will be a breath of fresh air for the face aficionado in your life. Face Cream: Water, Lavandula Angustifolia (Lavender) Water, Butyrospermum Parkii (Shea Butter) Fruit, Theobroma Cacao (Cocoa) Seed Butter, Emulsifying Wax NF, Simmondsia Chinensis (Jojoba) Seed Oil, Leuconostoc/Radish Root Ferment Filtrate, Stearic Acid, Lactobacillus & Cocos Nucifera (Coconut) Fruit Extract, Aloe Vera Gel ( Aloe Barbadensis Leaf Juice, Carrageenan, Citric Acid, Potassium Sorbate), Cocos Nucifera (Coconut) Oil, Argania Spinosa (Argan) Nut Oil, Glycerin, Sea Buckthorn (Hippophae Rhamnoides) Oil, Tocopherol (Vitamin E) Oil, Lavandula Angustifolia (Lavender) Oil, Rosa Centifolia (Rose) Oil. 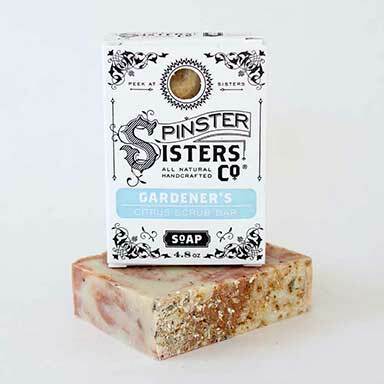 Rose Petal Toner: Organic Rosa Centifolia (Rose) Flower Water [distilled by Spinster Sisters Co.]. 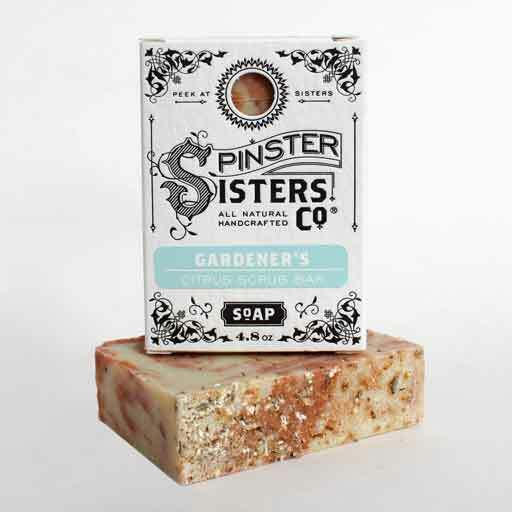 Oakmoss and Seaweed Face Soap: Olea Europaea (Olive) Fruit Oil, Cocos Nucifera (Coconut) Oil, Sustainable Elaeis Guineensis (Palm) Oil, Ricinus Communis (Castor) Seed Oil, Prunus Armeniaca (Apricot) Kernel Oil, Argania Spinosa (Argan) Nut Oil, fair-trade Butyrospermum Parkii (Shea Butter) Fruit, Theobroma Cacao (Cocoa) Seed Butter, Activated Charcoal, Evernia Prunastri (Oakmoss) Extract, Pine Resin, Amber Resin, Iris Germanica (Orris) Root Powder, Spirulina Maxima Powder, Irish Moss Chondrus Crispus (Carrageenan), Cedrus Atlantica (Cedarwood) Bark Oil, Salvia Officinalis (Sage) Oil, and Pinus Sylvestris (Pine) Oil.